12 beneficiaries from 7 countries (Finland, France, Germany, Italy, Portugal, Sweden, The United Kingdon). 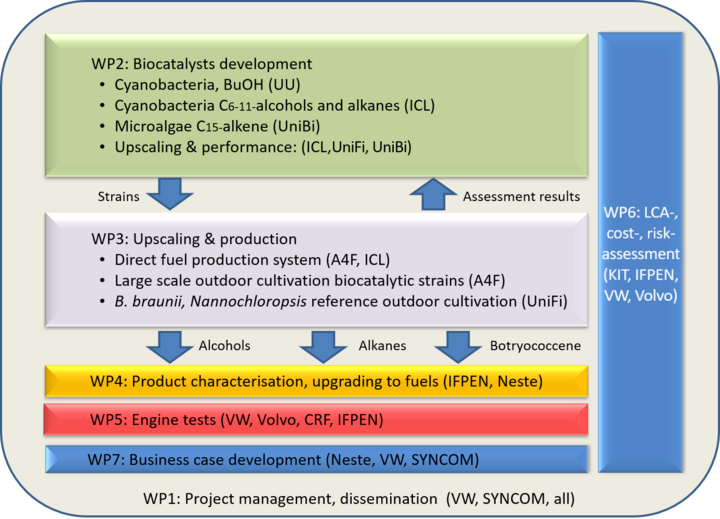 The overall objective of Photofuel is to make a significant contribution to the development of the field of biocatalytic production of solar fuels (from TRL 3 to TRL 4-5 level) and to assess the broad impact of this novel approach to fuel composition (also taking into account other emerging waste- and residue based fuels) and engine performance in the future. These activities are carried out as part of a joint industrial and academic consortium that encompasses all central but highly diverse areas of engineering (bio, chemistry, engines, assessment) and social science needed for this challenging task.